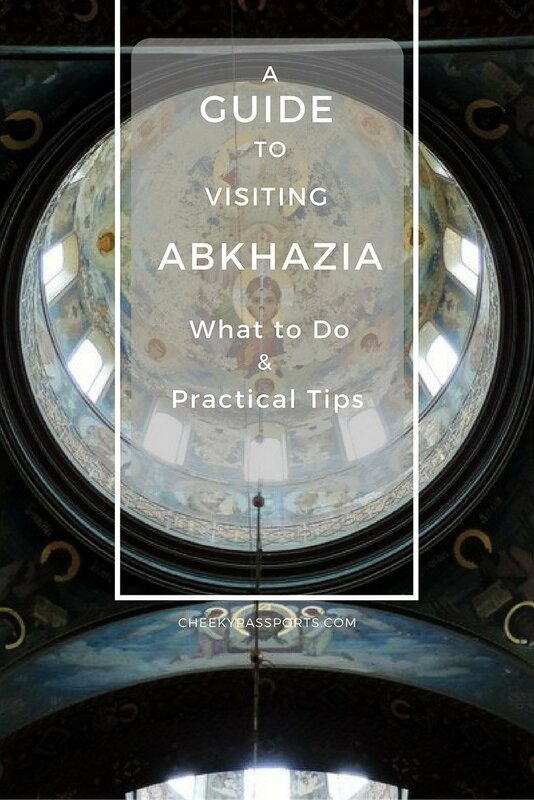 There’s something enticing about travelling to a place which nobody seems to know about (and which according to the UN is not even a country) and it was this very aura of mystery which inspired us to include visiting Abkhazia on our itinerary during our recent trip to the Caucasus. 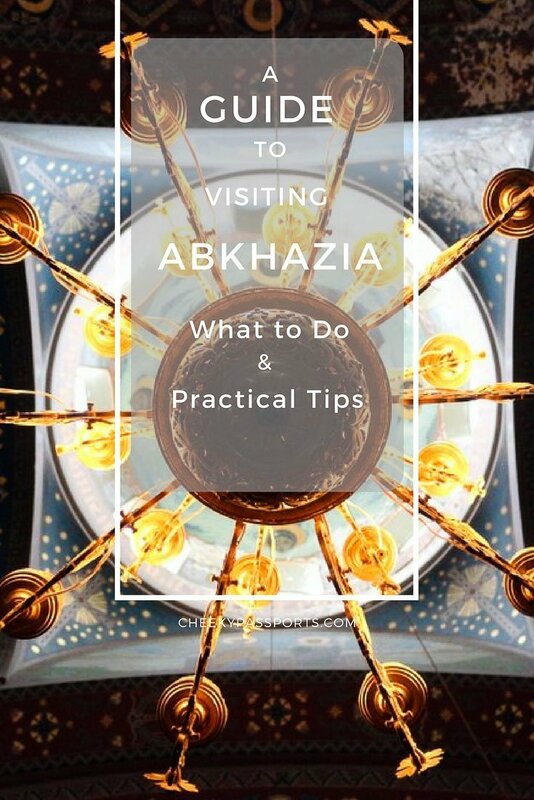 Most foreigners require a visa to access the region – if you are interested in the requirements of visiting Abkhazia, read our guide about obtaining a visa to visit the separatist state. It is important to note that visiting Abkhazia is usually discouraged and that most travel advisories warn against all travel to the region. Where and what exactly is Abkhazia? Usually described as a partially-recognised state, Abkhazia is considered to be an independent country by Russia, Nicaragua, Venezuela and Nauru whilst the rest of the world considers it to be an autonomous republic within Georgia. We chose to stay at the Leon Boutique Hotel in Sukhumi. The decision was simply based on reviews stating that the hotel employed English-speaking staff, which we thought was important in case we ran into any problems during our stay. The hotel was very comfortable and conveniently situated close to the promenade and most importantly, the reception staff spoke good English, the wifi signal was strong and internet speed adequate . An interesting breakfast of sweet porridge with a chunk of butter, pancakes or fried doughnuts and coffee was served every morning. Despite Abkhazia being popular as a destination that has good weather all year round, it rained steadily during our stay which put a damper on some of our planned activities. Sukhumi is a beach resort town catering to Russian tourists wanting to get away from the northern cold, however they couldn’t have been too happy to be visiting Abkhazia that week! We spent our first afternoon wandering about the Sukhumi promenade (or Naberezhnaya Makhadzhirov), occasionally taking shelter from the heavy downpour in the waterfront coffee shops. We would have liked to visit the famous Sukhumi botanical gardens that day there but were forced to change plans due to the bad weather. 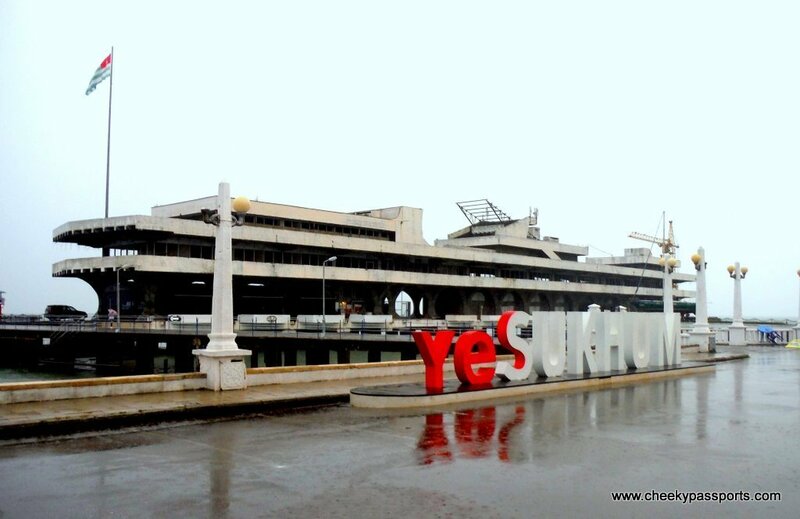 Sukhumi’s soviet-era inspired structures and architecture is immediately obvious. A short walk led us to Abkhazia’s former parliament building which was bombed and destroyed in the ‘92-’93 conflict between Georgian troops and Abkhaz separatists; a sobering reminder of a bloody war in which about 8,000 people were killed and families were torn apart when hundreds of thousands of people were forced to to flee their homes. Rain was forecast for all of the following day and since Abkhazia is home to the massive Novy Afon (New Athos) cave, going underground seemed to be a good alternative. This karst cave is located within the mountains around Novy Afon and is one of the deepest in the world with only a small part of it being accessible to casual visitors visiting Abkhazia. It seems that we were not the only people with the “keep dry in the cave” idea that day – the entrance was packed with Russian tourists complaining about the weather – or at least that’s what their hand gestures and disappointed faces seemed to indicate. Of course we understood nothing and nobody could even indicate where the ticket booth was located until we met a Russian man who did his best to help us by putting together some basic words in French which to us was more familiar than Russian. 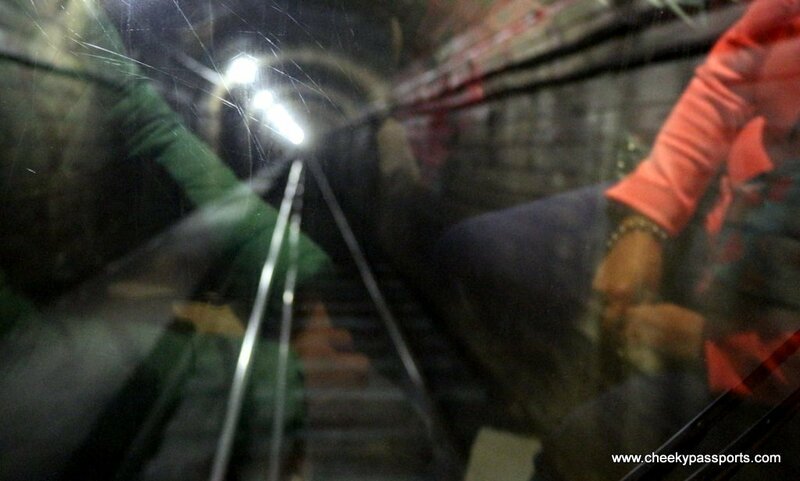 We were first ushered onto a train which which took us to the cave’s darker depths. Once we disembarked we were taken around the cave on a guided (Russian only) 1.5 hour walk. The cave is slippery on most parts and people seemed to be pushing each other around, so we were happy to have worn our trekking shoes. Different coloured lighting is used to define somewhat odd shapes created by stalactites and stalagmites; an underground lake lent a bit of spookiness to the overall setup. 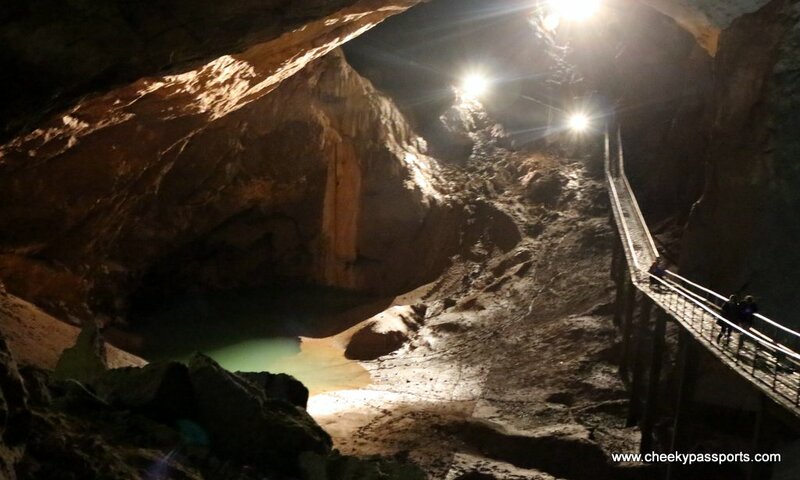 Perhaps the major attraction of the Novy Afon caves is the sheer size of its chambers and the fact that most of the cave system is still unexplored – it is definitely worth going to but do be aware that the cave system can only be experienced as part of a noisy guided tour. Price – 500 RUB (in 2016), camera fee – 50 RUB. 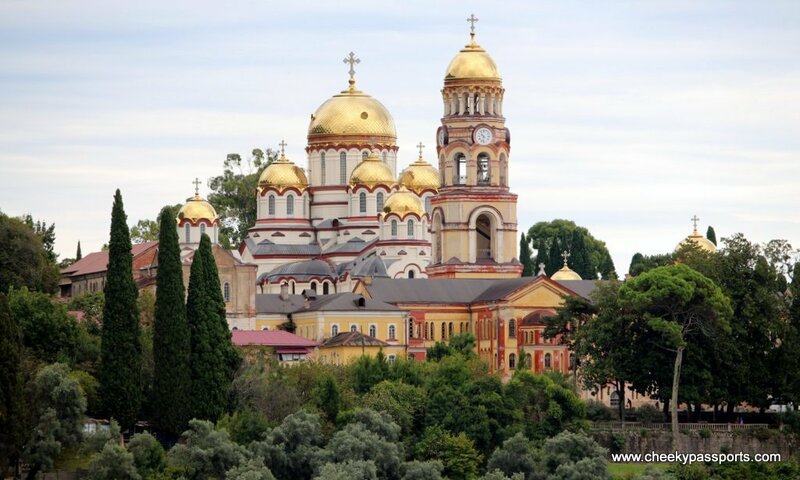 Located on a hill overlooking the Back Sea, the Orthodox monastery and its golden domes is visible from the cave site from where it can be reached easily. Women need to cover their head before entering and scarves are made available at the entrance (but we recommend carrying your own when visiting Abkhazia for hygiene purposes). 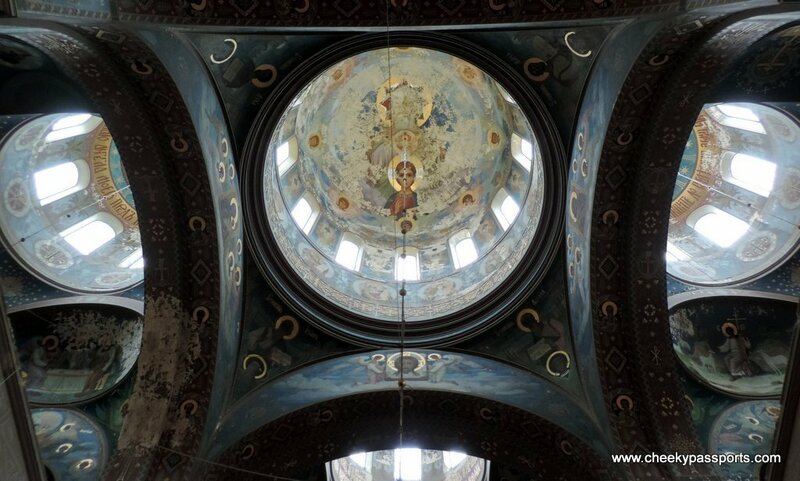 The inside of the monastery is very ornate with beautiful architecture and lovely frescos and is evidently a very special place to a number of devotees whose prayers and candles enhance the spiritual atmosphere. 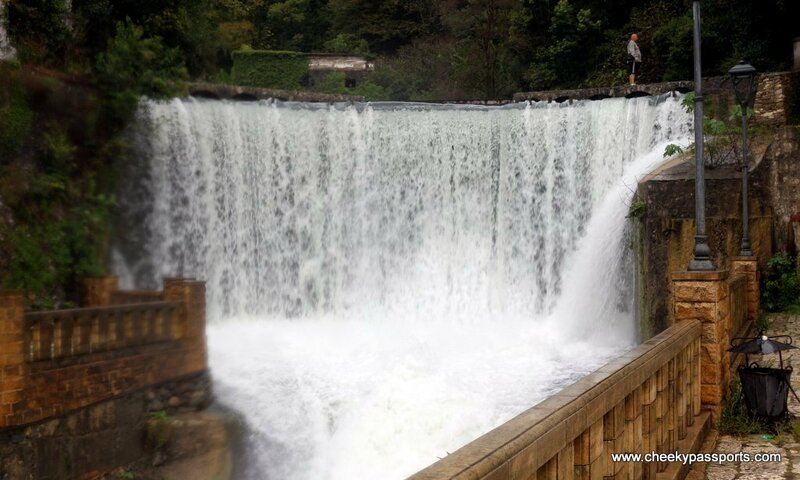 Not far from the monastery, a small artificial waterfall created by the monastery’s monks, feeds a small reservoir previously used to irrigate the monastery’s fields and crops. 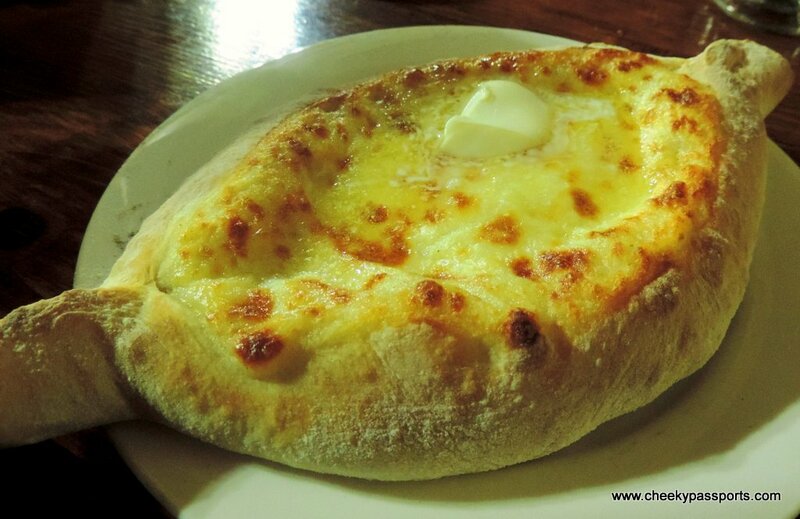 We discovered that Abkhazian food is just as rich as Georgian food with strong emphasis on agricultural products. We dined twice at a place called ‘Naarta’, a restaurant close to our hotel which specialises in local food. Menus are Russian only and not one person in the packed restaurant (including waiting staff) could speak any language we were were familiar with. 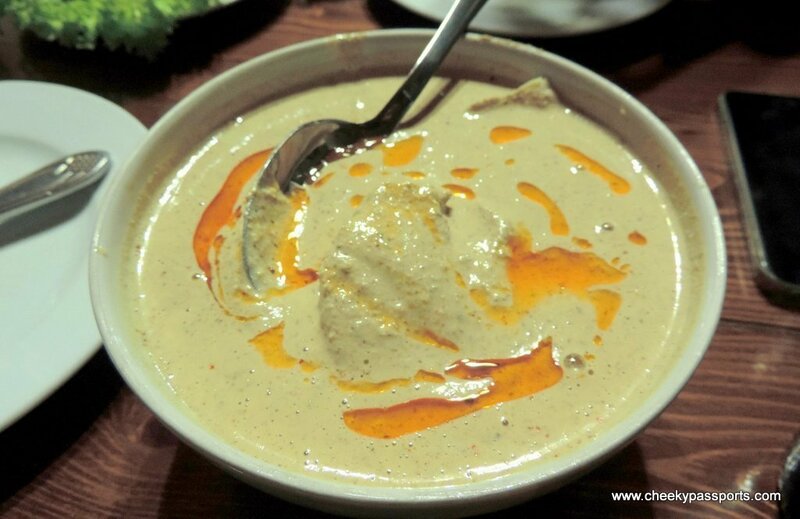 The visual character recognition feature on the Google translate app came in handy whilst visiting Abkhazia, although at times, even though the app did translate the names of the dishes, we were still at a loss as to what they actually were or contained, so much that ordering our food became a very unsuccessful game of charades! Luckily we typically look forward to some gastronomical adventure so this in itself was a lot of fun. We did end up over ordering (as usual) and got to sample a good selection of local dishes, some of which remain unidentified. Although we didn’t make it here due to the bad weather, we are including it in our list since we understand that a trip to this beautiful lake should be on any traveller’s itinerary when visiting Abkhazia. Phone reception and wifi – Although we had no phone reception using our home network sim cards (pretty sure that coverage is pretty limited with any network) wifi seemed to be widely available although the speed was iffy in most places. 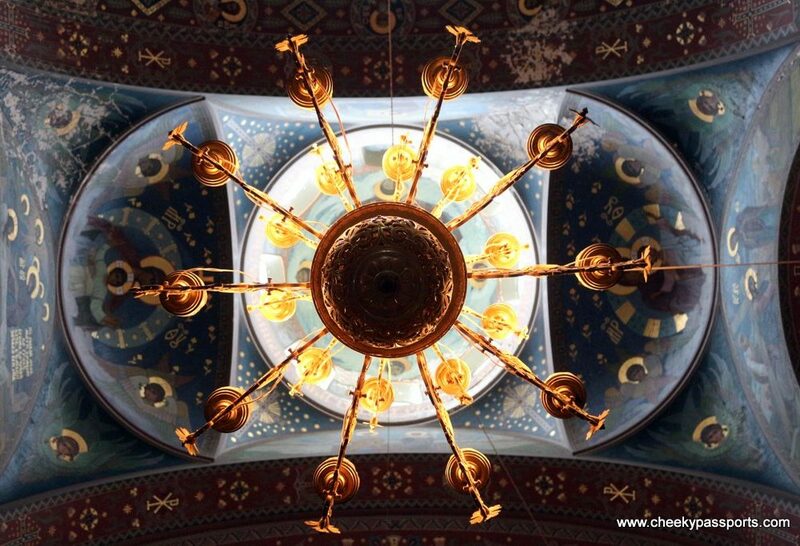 Getting around whilst visiting Abkhazia – it is not currently possible to drive over to Abkhaiza from Georgia. Public transport is available but unless you know some Russian, it will be very difficult to catch a bus to your location of choice. Your best bet is a taxi (have your destination written in Russian on a piece of paper to show your driver) or a coach tour (in Russian) with pre-determined stops. It may be worthwhile asking the receptionist of your hotel to pre-book a taxi for you so that they can negotiate the price ahead on your behalf. Have a Russian phrasebook handy – we cannot stress how important this is. Unless you do know some Russian, ensure that you have access to a phrasebook or a translation app. Assume that when visiting Abkhazia, you will not meet anyone who speaks or understands any language other than Abkhaz and Russian. 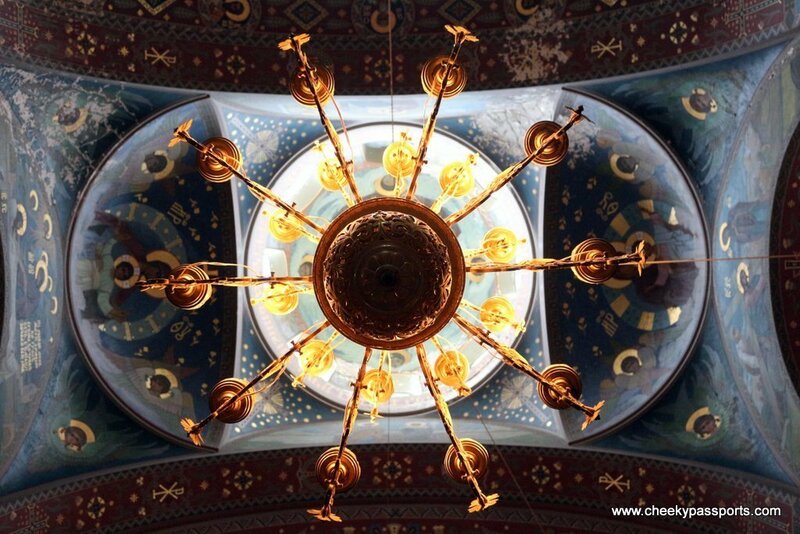 Carry a headscarf (for women) – women are required to cover their head in most Orthodox monasteries and churches. Although headscarves are often made available at the entrances we strongly recommend carrying your own for hygiene purposes when visiting Abkhazia. Do not visit unless you like adventure! – the region is highly volatile and although we did not experience any safety issues ourselves, we were aware that situations could become rather unpredictable, especially since we could not read or understand the language, hence finding it difficult to communicate. In spite of this, we found the local people to be helpful, although very amused at our obvious confusion when visiting Abkhazia!